May 22 was National Maritime Day, and at the Inland Marine Expo (IMX) in St. Louis, it was celebrated by a rousing talk on the day’s origins and history given by Rev. David Rider, executive director and president of the Seamen’s Church Institute (SCI) of New York and New Jersey. Rider spoke of the enduring concern of President Franklin Delano Roosevelt with seamen’s issues. “Maritime Day was the direct result of FDR’s leadership,” Rider said. FDR joined the SCI’s board in 1908. It was the only charitable board membership he retained as president, and he was a vice president of the SCI on the day he died. Accompanied by slides of photos from SCI’s past, including of a building in New York that had a ship’s wheel and other instruments on its roof, Rider said that technology has always driven the marine industry. The SCI was always involved in training and certification of seamen, and today is known for its bridge simulators. Rider was followed by Peter Stephaich, chairman and CEO of Campbell Transportation Company, who spoke on challenges facing river transportation. Campbell operates mostly on the Ohio River. Stephaich noted that his company has enjoyed growth in a difficult market. Its marine transportation services division owns and manages more than 1,100 barges and a well-maintained fleet of 50 towboats and harbor vessels. The company’s barges move about 120 million tons of products a year. Campbell has 23 harbor fleets, and manages assets for third-party companies, moving another 20 million tons on their barges. Stephaich noted that the steam coal market is in serious trouble, since no new coal plants are likely to be built in this country and hundreds have closed. But “coal will still be around for the next 20 or 30 years” to serve existing plants, he said. Stephaich said the upper-Ohio-River industry is recovering from what he called the worst winter he’d seen in his 22 years in the industry. At the moment, the industry is actually short on open hopper barges, as customers in the region seek to rebuild their inventories, he said. Long term, however, “structurally, there are too many barges in the system,” he said. Private equity funds continue to be interested in the barge industry, he said, although they are typically looking for five-year windows to make back their investments and towing equipment can last for up to 30 years. Stephaich said the days when the industry would try to “keep our heads down” and stay out of politics are long gone. “If we’re not engaged, we’re not going to get this infrastructure built,” he said. He called on industry officials to develop relationships with as many of their congressional representatives as possible, regardless of party affiliation. Hopes were high with the election of Donald Trump, Stephaich said. “He was our guy—Pennsylvania, Ohio, coal, steel manufacturing. We had some of the highest turnout and some of the highest-percentage wins for Trump in our region. We were elated” when Trump won, Stephaich said. Stephaich is currently vice chairman of Waterways Council Inc. (WCI). 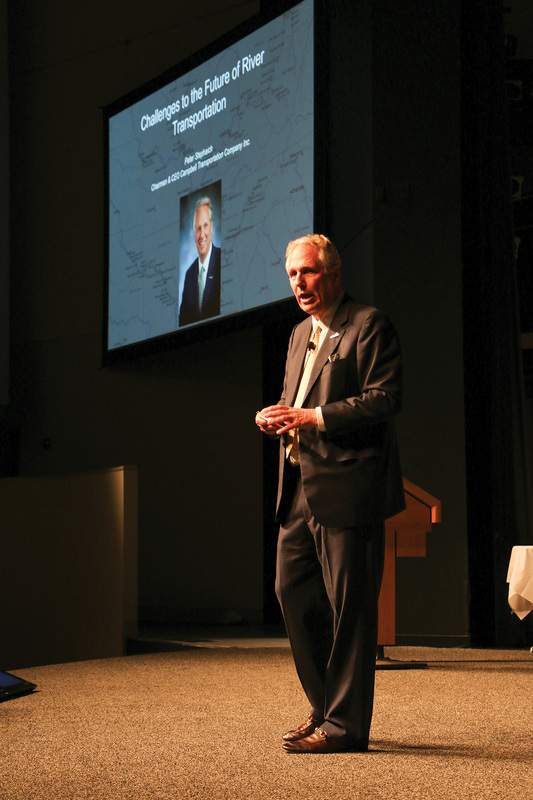 Working with Congress, WCI is pushing two proposals to boost spending on infrastructure, he told the IMX audience. One would divert 10 percent of the government’s hydro-electric power revenues to the Inland Waterways Trust Fund, producing around $150 million a year. The other would increase the cost share for trust fund projects, from 50-50 to 75 percent federal, 25 percent industry. Those changes would get the Corps’ new construction/major rehab budget to about $400 million a year, he said. Also during the keynote session, several awards were presented. Bruce Gibson of Wepfer Marine was presented with the IMX Achievement Award, honoring a lifetime of service to the industry. IMX also honored 40 young industry professionals with the inaugural “40 Under 40” awards. The WJ will present stories on each of the 40 Under 40 honorees in the coming weeks.